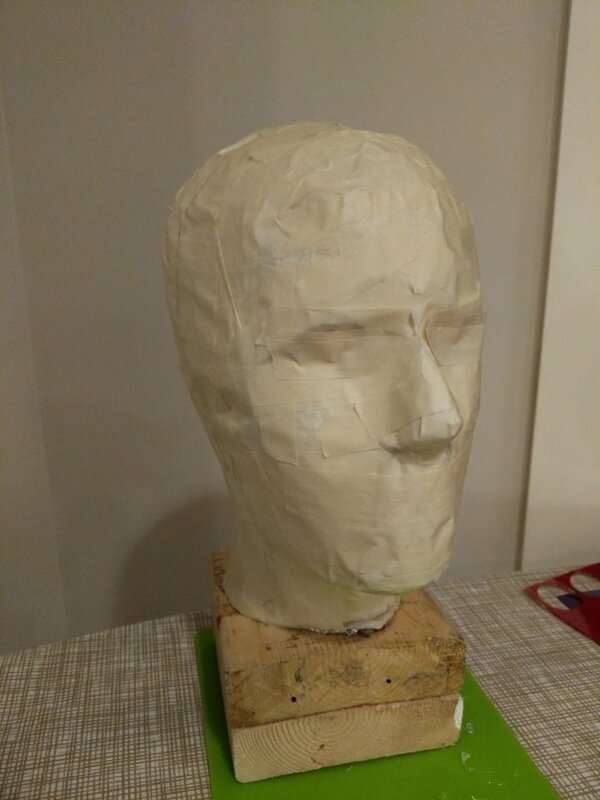 In my previous posting, I talked about my big fail trying to create a crude mannequin of my own head. Picking the wrong filling strategy (spray foam) quickly led to a total loss of the project. That’s super annoying, but the time investment to get to that point was only a couple hours, so I gave it another shot. The masking tape process probably came together a bit better this time, leveraging my earlier experience. Combining the two haves on the other hand was trickier for reasons I don’t understand. For filling, I tried to stick to the method in the video guide. 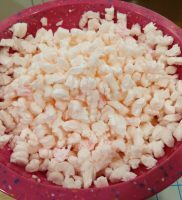 I still didn’t have any stiff packaging Styrofoam, but I did have an old box full of packing peanuts. 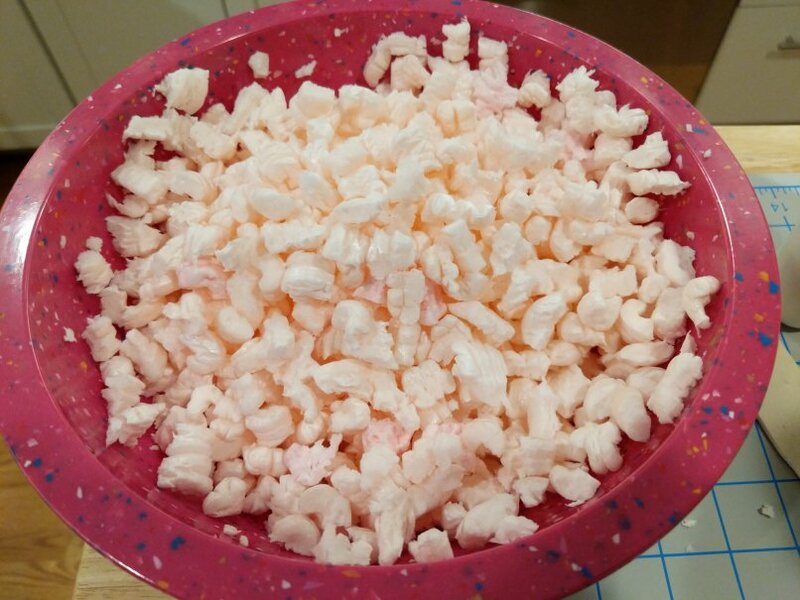 I haven’t seen packing peanuts actually used in shipping in years, so it’s probably not a common thing to have on hand. I had a few different kinds mixed together in my box. S-shaped peanuts. Figure-8 peanuts. Peanuts that look like beige cheesy poofs. 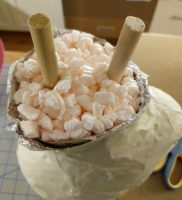 The poofs are made of cellulose and dissolve in water, so they’d be a bad fit for this project. They were also way squishier than the others. I went with the S-peanuts exclusively since they were firmer and they broke up into small pieces very easily. 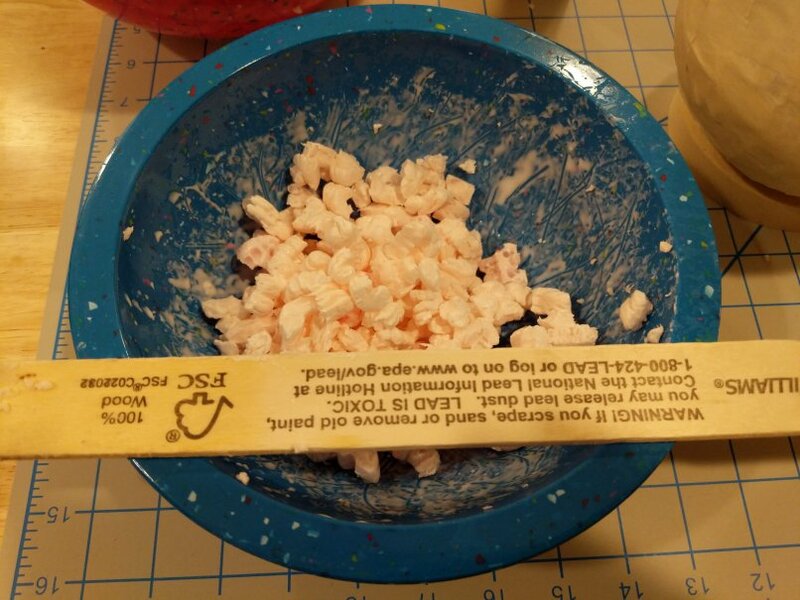 After filling a bowl with broken up peanuts, I mixed small batches with Elmer’s glue and then packed them into the head. 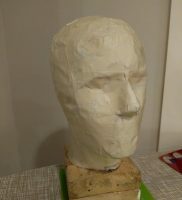 With the cardboard supports in the way, it was difficult to direct the filling into all the spaces deeper in the head cavity. 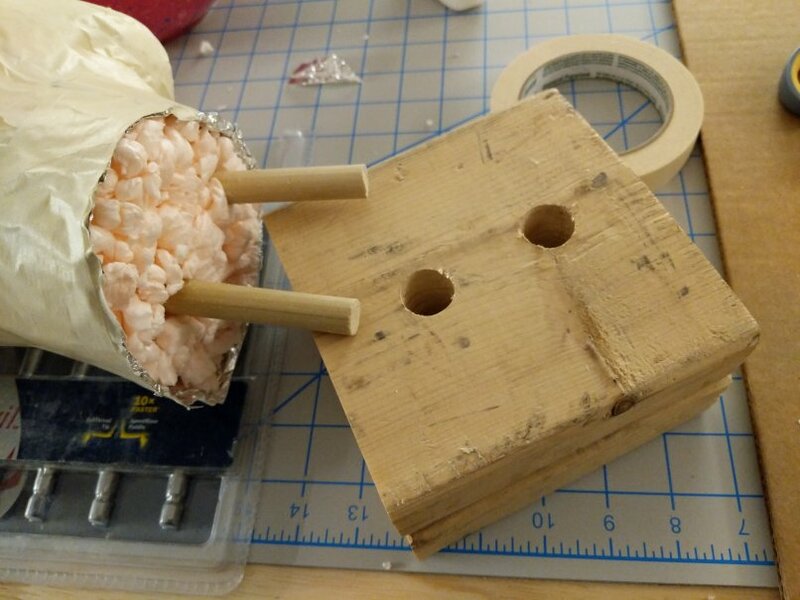 This only got worse after inserting 2 wooden support dowels halfway through. 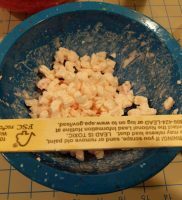 I ended up using about 4 mixing bowls worth of peanut bits before filling it to the top. 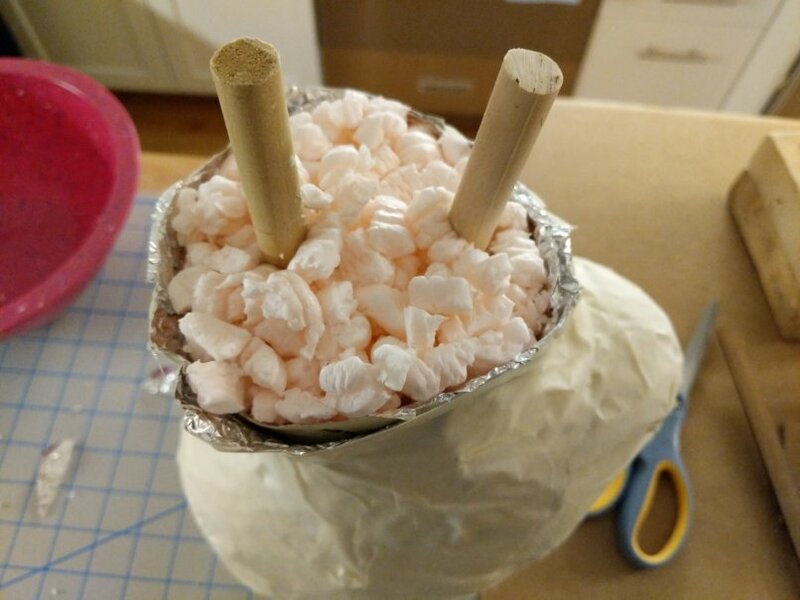 After leaving the glue-soaked bits to cure over night, the head still felt really soft, and stiffer Styrofoam chunks would have probably been better in this case. For the base, I didn’t have any more spent tape rolls lying around. I sacrificed my only one on the previous disaster. For a substitute, I cut two square pieces from 2×6 framing lumber, stacked them, and drilled two 3/4 inch holes. Stacking the two pieces gave me enough height to insert the wooden dowels without hitting the table below. 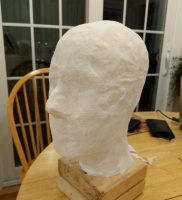 The base and perimeter of the “neck” was glued down with hot glue. 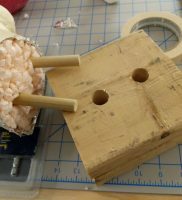 The drilled holes were wider than my dowels, so I injected hot glue into the remaining space to lock the dowels in place. It’s a nice stable base and I think it’s better than the tape roll method. I followed the rest of the recipe to the letter. 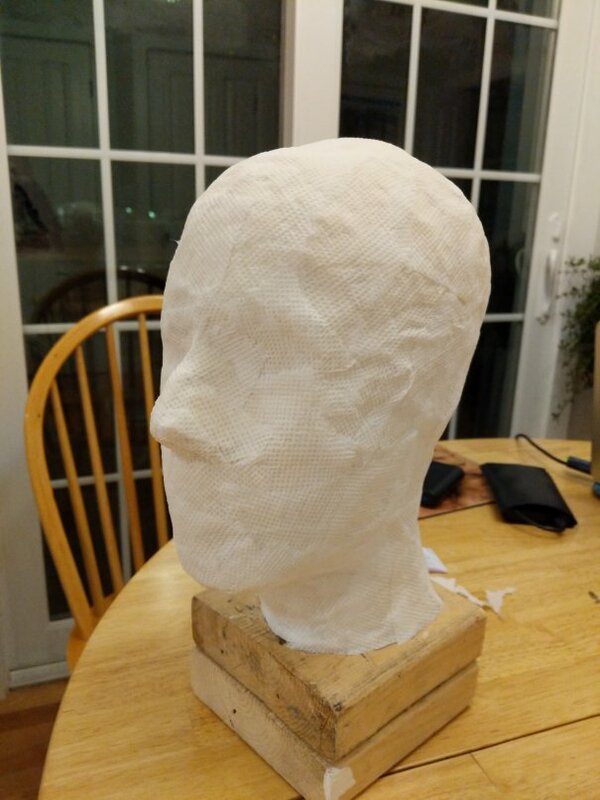 I coated the head in “paper towel gauze” with brushed diluted Elmer’s glue. 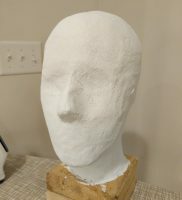 This was also the place to make some minor corrections, like filling a wide dent in the forehead I created when I had it upside down for filling. 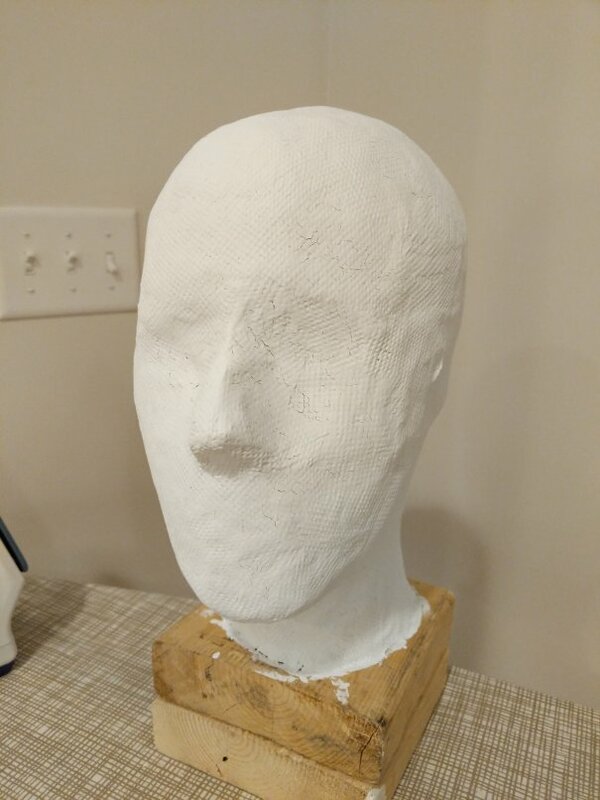 Once the head was allowed to dry overnight, I painted over it with some ceiling paint I had on hand. I ended up with a lot of small cracking in the paint after it dried, so I probably applied the paint too thick. Though the paint was a bit old and I suspect not in great condition. The wet paint ended up softening the shell, but the end result is firm. I’m not planning to test that with any significant force, but it should be usable for projects.